Well the two month wait is finally over. My vanilla extract (see original post) has finished it’s mandatory 2 month extraction phase. I did a little taste/smell test, comparing the home brew extract to a bottle of McCormick’s Real Vanilla Extract. The homemade stuff smells sweeter and looks a little lighter. I find the McCormick extract to have a bit of a chemical odor when compared to the home brew extract. I started with two handles of vodka and ended up with 12 8-ounce bottles of extract. Considering the cost of the ingredients I’d say it was a pretty good deal. I included a split vanilla bean in each bottle to continue extraction. This way the extract will continue to age and darken over time. 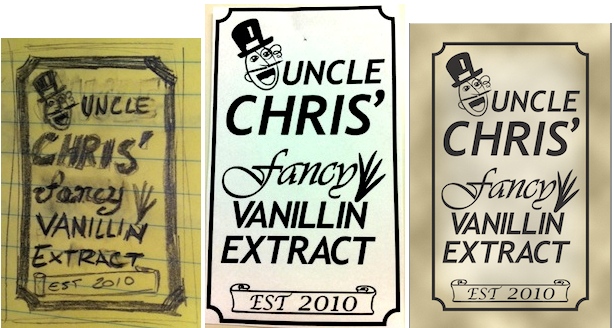 One of the most fun parts of this project was designing an old timey label to go on the bottle. 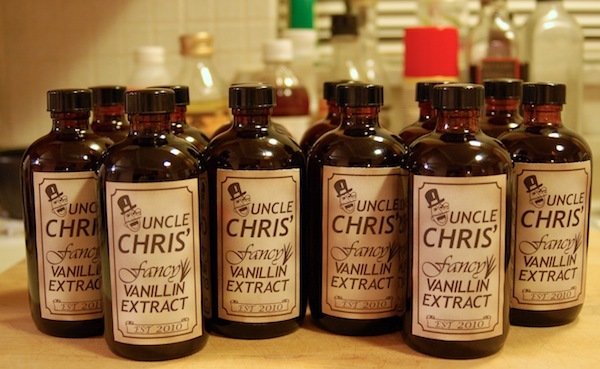 I settled on the name “Uncle Chris’ fancy vanillin extract” which seemed sufficiently old timey. I sketched up a drawing of my label and handed it over to my girlfriend who did a great job making it into a vector image. She then applied an aged look to the label for printing. Below is the evolution of the label. I ordered the bottles from Amazon, having glass shipped is really expensive so using my Amazon Prime shipping was easily the cheapest way to get these. Eight ounces seemed to be the most practical size and I really liked the look of these brown bottles. 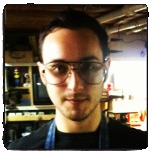 In addition to labeling all the bottles I also numbered and dated them. Beyond just being OCD the dates are on there because according to my original recipe the extract should continue to improve for the next 4 months. Here are pictures from the bottling process. I’ve yet to cook with the extract myself but early reports are positive. In general I’d say this is a pretty easy project worth trying. A++ would extract again.